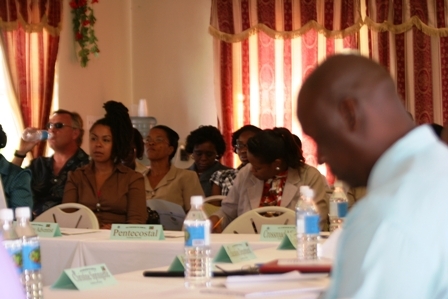 NIA-CHARLESTOWN NEVIS (March 10, 2011) — No one entity could successfully fight crime on its own. That was the view expressed by Permanent Secretary in the Premier’s Ministry Ms. Angelica Elliott, when she delivered opening remarks at the second Symposium on Crime under the theme “Reclaiming our Society”. The forum was hosted on Thursday, by the Premier’s Ministry in the Nevis Island Administration (NIA) at the Red Cross Building in Charlestown. 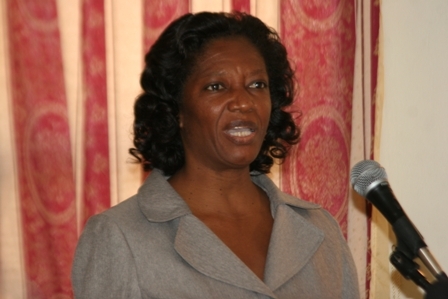 She underscored the Joseph Parry led-NIA’s commitment to the St. Christopher and Nevis Police Force Nevis Division and pointed to key steps that had been taken, to assist the law enforcement body in its fight against crime since the first Symposium in May 2010. “At this time the Administration stands tall, confident of the fact that the commitment made to Police has been kept… Government needs the Police, the Police needs the church, the church needs the home [and] the home needs the school. If we do not pull our equal weight, we fail,” she said. Ms. Elliot thanked all who continue to partner with the NIA in its fight against crime on the island and urged all to work hard, hand in hand, for it was a fight that had to be won since losing was not an option. She reflected on the first symposium and noted that much data had surfaced with regard to the levels of anti social behaviour that existed in schools and the community and as a result there was a serious call made for values to be examined. An interactive session dubbed “Next Steps in Prevention/Rehabilitation” in which participants were asked to come up with specific steps for implementation to curb the level of anti social behaviour on the island. The three month target was postponed from September 2010 to March 2011. However, she said that did not deter the police, schools and the Government from continuing to address the matter while criminal elements in the society continued to work also. Notwithstanding, Miss Elliott said the NIA remained focussed on the fight against crime and continued to demonstrate its commitment to arresting the scourge of crime in tangible ways. “It was the brainchild of this government to envelope a group of at-risk-for-gang youths and get them to Trinidad and involved in programmes that helped them to develop technical skills. “It is the brainchild of this government to create programmes headed by Pastor Euclid Lawrence which not only taught his students technical skills but exposed them to life and social skills as well,” she said. A number of sectors were represented at the Symposium among them Education, Police, Religious, Expatriate Community, Social Services, Guidance Counsellors and the Private Sector.